We have been delivering a full service agency experience for Weeton's of Harrogate for 2 years now. 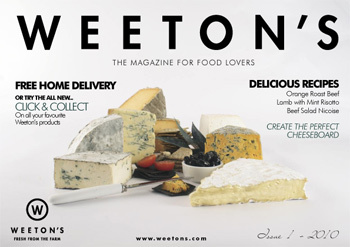 We have worked on weetons.com, and online food shopping website delivering the very best Yorkshire produce throughout the UK. We have produced luxurious brochures for Weeton's for use in-store to showcase their best products and have run advertising campaigns to re-enforce the brand proposition and drive sales. We came up with a concept which we presented to Weeton's for a new magazine to help showcase their finest produce, recipe ideas and new product concepts. This 16-page publication was distributed both in-store (and included with customer's bags as they leave) and door-to-door throughout Harrogate. Visitors of Weeton's come from far and wide and it has a superb reputation for exceptional standards of food across the board. The magazine has helped to promote the new Weeton's website and drive repeat business from a growing local and national customer base. The Cheese Club was a concept we came up with for Christmas 2010. It was an instant hit and help boost online sales in December 2010 by 58%. The concept was simple - four expertly selected and seasonal cheeses (totalling 1kg) delivered every month with a box of Fine Cheese Co. Crackers. 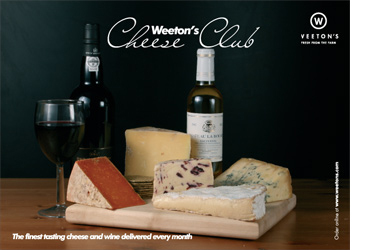 We promoted the cheese club through another 16-page landscape printed magazine in-store and via a pay-per-click campaign for the keyphrase 'cheese club'. Many of Weeton's core customer base live and work in Harrogate. Weeton's is just opposite the stray and many customers pass the shop on the way into and out of Harrogate. By offering a 'click and collect' service through their website, we have helped Weeton's cater to customers who are short of time and just want to 'pick something up on the way home'. Customers simply order before 10am and then collect at any time after 3pm. Click & Collect is an example of flexibility. For some customers who are passing by the shop, it's simply more convenient to pop in and collect a parcel of goodies than have them delivered by courier. If customers order online, they also benefit because all their goods are packed and ready and waiting for them to collect. The Weeton's website has been one of our most exciting projects because it has involved such a wide skillset. The website is a prime example. Weeton's have '000's of products in-store but they change with the seasons and trends at a fantastic pace. This presented a problem for Weeton's because they couldn't sell products they might not have in stock next week or next month. We helped to create a web service which created a seamless link between Weeton's stock management system and the online database. What this means is that there is a permanent link between the stock levels online and the stock levels in-store (so at no point do you sell anything you haven't got!). This has meant that we can effectively have the entire store mirrored online offering customers the ultimate shopping experience. The website needed to reflect the brand and the Weeton's brand is all about exceptional food standards. So, the Weeton's homepage presents a rotating flash banner giving some of the highlights. We have been working on the site since April 2009 and in that time we have more than doubled average visitor numbers and trebled the time people spend browsing online. 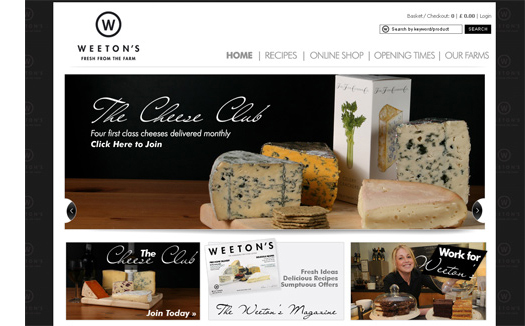 All of the product shots in you see on the Weeton's website were produced by us (including the cheese ones on this page). We have a studio set-up on-site at Weeton's and go in once every couple of months to photograph all their latest products to keep the site fresh and up-to-date.